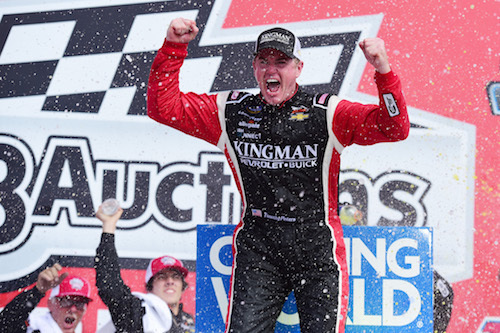 Timothy Peters stint with GMS Racing in the NASCAR Camping World Truck Series was supposed to end after three races, the last of those being Oct. 13 at Talladega (Ala.) Superspeedway. But after Peters won the Talladega race, GMS kept the Truck Series veteran around and extended its deal with Peters to include Saturday’s Texas Roadhouse 200 at Martinsville Speedway in Peters’ home state of Virginia. Peters has raced at least on a part-time basis in the Truck Series since 2005. He raced full-time in the series from 2009 through 2016. He began the 2017 season as a full-time driver for Red Horse Racing, but that team shuttered its operation after the fifth race of the season. Peters has been able to find a full-time Truck Series ride since then. In all, Peters has made 242 starts in the series, resulting in 11 wins, 59 top-fives and 125 top-10 finishes. In his final full-time season, he was among the four finalists vying for the series championship in the season finale at Homestead-Miami Speedway.